News briefing with national and international stories, including: Yinka Shonibare lends support to new creative awards set up in response to Brexit; LA's Museum of Contemporary Art fires its chief curator; H&M drop lawsuit against street artist following outcry. 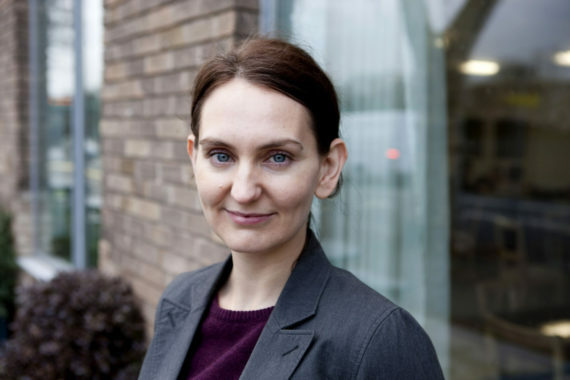 Spike Island’s Helen Legg appointed new director of Tate Liverpool Helen Legg, director of Spike Island in Bristol since 2010, has been appointed director of Tate Liverpool. She will take up the position in the summer. 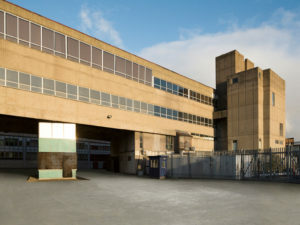 Prior to joining Spike Island, Legg was curator at Ikon Gallery, Birmingham from 2005-2010. Director of Tate Maria Balshaw said of the appointment: “We are thrilled to announce that Helen Legg has been appointed director of Tate Liverpool. As the gallery enters its fourth decade, Helen will lead the institution into a new era. Legg, who in 2014 was a judge for the Turner Prize and a selector for the Paul Hamlyn Foundation Artist’s Awards, has almost two decades of curatorial experience. 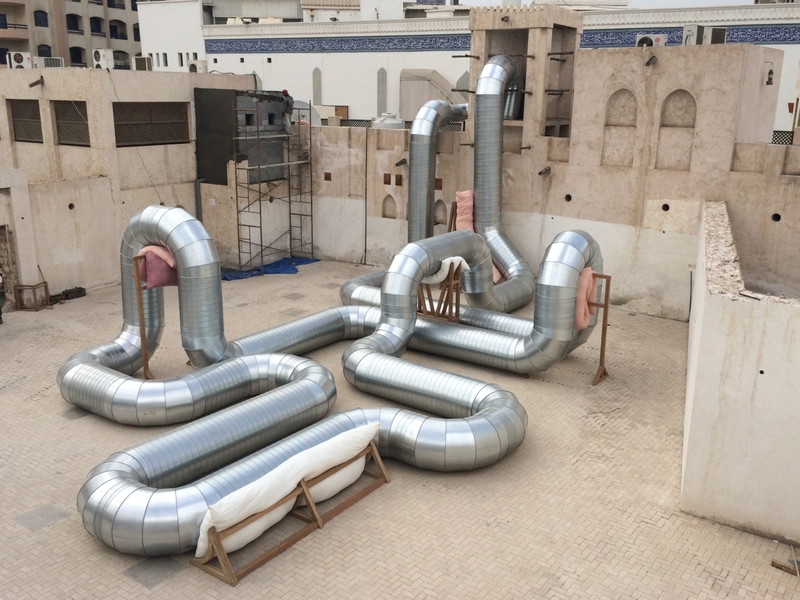 She has worked with British and international contemporary artists, including Hedwig Houben, Anthony McCall, Haroun Mirza, Tatzu Nishi, Laure Prouvost, Cally Spooner and Gillian Wearing. LA’s MoCA fires its chief curator Helen Molesworth, the chief curator of the Museum of Contemporary Art in Los Angeles, was fired by its director Philippe Vergne, the Los Angeles Times reports. An email sent to trustees on Monday afternoon said that Molesworth was stepping down from the position. But artist-trustee Catherine Opie told the newspaper that Vergne fired the curator for “undermining the museum”. Since joining MoCA in 2014, Molesworth has helped revive the museum’s programming with exhibitions including the well-recieved travelling retrospective of the artist Kerry James Marshall. However, Hyperallergic reports that the Los Angeles art community has mixed feelings about Molesworth’s tenure, with some MoCA staff complaining that she contributed to a toxic work environment. Others state that it is too simplistic to paint her dismissal as simply a clash between her agenda and that of the gallery’s director, who has curated three shows of white male artists — Carl Andre, Matthew Barney, and Doug Aitken — since arriving at MoCA in 2014. New Banksy mural speaks out against Turkish-Kurdish artist’s imprisonment The street artist Banksy has created a new mural in New York with fellow street artist Borf in protest at the imprisonment of Zehra Doğan, a Turkish-Kurdish artist and journalist. The mural appeared on Thursday, a few days after a Banksy rat was spotted on the city’s 14th Street. Doğan was arrested on 21 July 2016, partly for painting an image of the destruction of the Kurdish-majority city of Nusaybin by Turkish government forces. The painting showed the city in ruins with Turkish flags flying above and was based on an image circulated by the Turkish military via social media. Yinka Shonibare lends support to new creative awards set up in response to Brexit The artist will join a panel of judges for the recently created Emerge Awards, a UK-wide open competition championing emerging talent and diversity in the creative industries. Guy Armitage, CEO of Zealous, a London-based digital submissions platform for the creative community, set up the award in response to the changing nature of Britain’s relationship with Europe. Other judges include Kathleen Soriano, chair of the Liverpool Biennial, Mark Cass, founder and CEO of Cass Art and chair of the Cass Sculpture Foundation, and Cherie Federico, director/editor in chief of Aesthetica. Arts Council England announces successful applicants in final round of Ambition for Excellence awards Seven organisations are receiving a total of £3,249,087 from Arts Council England’s final round of Ambition for Excellence, funded by the National Lottery. The awards include £745,000 for Sunderland Culture‘s Believe in Me: Cathedrals to Creative Cities, a visual arts project celebrating the district of Wearside, uniting the cities of Sunderland and Durham which share the River Wear. 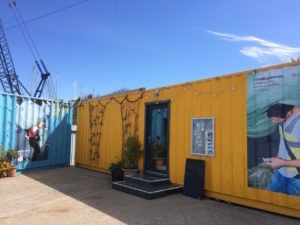 On Time + Place received received £160,000 for a three-year project that will bring existing large-scale, outdoor, free artworks from around the globe, as well as new international co-commissions, to the people of Ipswich and beyond. Hull City of Culture 2017: Audience of five million for events Research carried out by the University of Hull’s Culture, Place and Policy Institute shows Hull’s tenure as the UK City of Culture attracted an audience of more than five million people, £220m of investment and 800 new jobs. An “extraordinary” 95% of city residents went to at least one cultural activity. Only about 20% of visitors were from elsewhere in the UK. Other key findings show younger audiences aged 16-34 years old were under-represented at events, though there was a high representation of people aged 55-64; a “significant increase” in arts and culture participation and a new confidence in the city. About 2,4000 volunteers provided an estimated 337,000 hours of help. Vase bought for £250 in the 1970s sells for £381,000 at auction A Hans Coper vase has broken the sales record for modern and contemporary studio pottery, selling at an auction in Devon for £381,000. Previously owned by a pensioner whose husband had paid just £250 for the item in the 1970s, it had been stored in a cupboard following his death. H&M drop lawsuit against street artist following outcry The Swedish clothing company had taken legal action against the street artist Revok who had attempted to receive compensation after his artwork featured in an advertising campaign without his consent. Graffiti painted on a handball court in Williamsburg, Brooklyn, had served as the backdrop for the H&M photoshoot. As Hyperallergic reports, H&M’s suit could have had major implications for street artists. If a judge had ruled in favour of the retail company, it could have stripped street artists of many rights that protect their work, preventing them from suing for infringement. 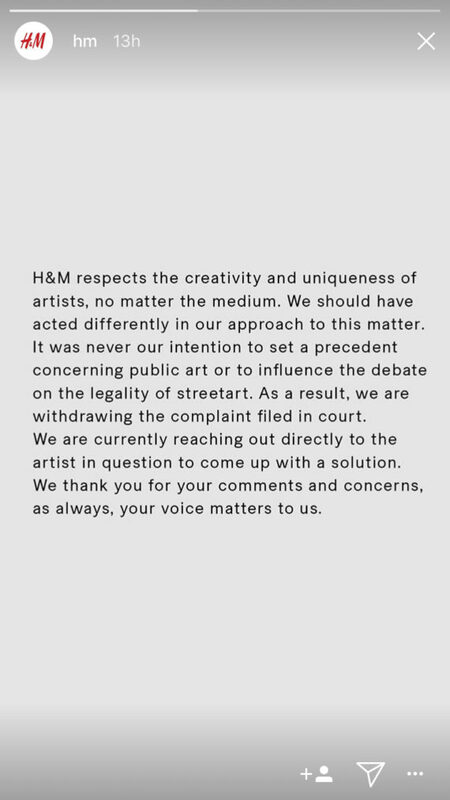 Artists including INSA, KAWS, and Lady Aiko had denounced H&M for its ‘assault on artists’ rights’, calling for a boycott of the company. In response, H&M shared a statement in a story on Instagram saying that it is withdrawing the complaint.